Steve Hargadon: Classroom 2.0 at 25,000 Members - What Has Social Networking Done for You? 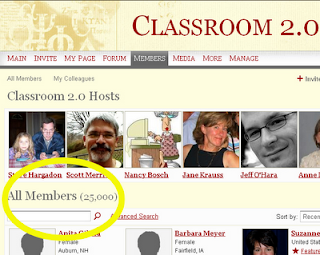 Classroom 2.0 at 25,000 Members - What Has Social Networking Done for You? If you're willing, would you share how social networking--Classroom 2.0 or any other network you belong to--has impacted you, both personally and professionally? You can answer here or at the Classroom 2.0 thread. Just wanted to congratulate you guys on reaching an awesome number - well done! @DK: thanks. Will look forward to catching up with you at some point! It's amazing to think about how far social networking has come in such a relatively short period of time. It wasn't long ago that I felt alone in trying to make technology a more valued educational component in my school and district. I joined Classroom 2.0 and wasn't sure exactly what I was getting into. Classroom 2.0 and subsequent involvement in other Nings, Twitter, Plurk, etc. have made an immeasurable impact on my personal and professional growth. Now I don't what I would do without them. Thanks to you and all those who have created them, nurtured them, promoted them, and participated in them. What a huge accomplishment! I am so glad that I joined the networks 2 years ago and brought it out to the eastern part of NA. This network is my global lifeline to others educators with similar thoughts and practices 21st Century instruction. Thanks for you dedication to education and the continued weekly webinars! We must continue to get the word out about this network and its endless possibilities.